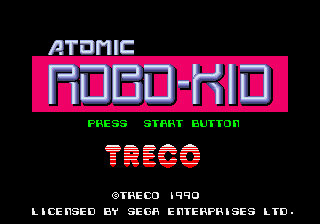 Atomic Robo-Kid (アトミックロボキッド) is a 1988 arcade game by UPL. Treco ported it to the Sega Mega Drive in 1990. Radiation and alien invasion have nearly destroyed the Earth outpost colony Terra-12, and it's up to you, Atomic Robo-Kid, to stop it. shoots; there is no rapidfire. jumps. You aren't bound to the ground — hit and to fly in mid-air or go back to the ground. appears to do nothing. Main article: Atomic Robo-Kid/Magazine articles. Main article: Atomic Robo-Kid/Promotional material. NEC Retro has more information related to Atomic Robo-Kid Special.